The BTR-152 and BTR-40, the first two Soviet mass-produced APCs developed after the Second World War, gave the Soviet Army useful experience with wheeled armoured personnel carriers. However, even as they were designed, they weren't suited for the needs of the Soviet Army as they lacked a roof (which was added in later versions designated BTR-152K and BTR-40B respectively). The low combat values of the BTR-152 and BTR-40 were exposed when the Egyptian Army used them during the Suez Crisis. This was one of the reasons why the new APC was developed. Between 1956 and 1957, a decision was made to convert all rifle and mechanized divisions into motor rifle divisions and a requirement for a new transport vehicle was drawn up. ZiL-153 at the Kubinka Tank Museum. Development proceeded along two paths: a more expensive vehicle that would eventually become the BMP-1, for use in tank divisions, and a cheaper vehicle for use in motor rifle divisions, that would eventually become the BTR-60. Two design bureaus were given the requirements, GAZ led by V. A. Dedkov, and ZiL led by Rodionov and Orlov. The requirements stated that the vehicle should have all wheel drive, at least two turnable axles, independent suspension as well as mobility and fording capabilities allowing it to operate alongside tanks. The vehicle was also supposed to be amphibious. The GAZ design team started to work on the new APC during the winter of 1956. Despite the fact that the army wanted a fully roofed vehicle with NBC protection system, the GAZ design did not have those features. It was argued that firing from the cramped interior would be difficult and that the limitation of losses wasn't a priority. The prototype was built between 1957 and 1958. ZiL developed a 6x6 design, the ZiL-153, similar in hull shape to the GAZ design. There were also three other 8x8 prototypes: Ob'yekt 560 (also known as MMZ-560), Ob'yekt 1015 (developed by KAZ), Ob'yekt 1015B (developed by KAZ, it had with a turret-mounted armament and stream propellers, also known as BTR-1015B) and Ob'yekt 1020B (developed by KAZ). All prototypes were submitted to and passed state trials in 1959. Even though the Ob'yekt 1015B performed best, the GAZ design was selected and given the designation BTR-60P. Officially, the committee that made the decision did so because of the GAZ plant's production capabilities and experience. The main reason was that the GAZ design was the simplest and cheapest one and introduced the lowest amount of technological advancements, which made it easier to put into mass production. BTR-60P had open-roofed crew and troop compartments, which was deemed to be a serious disadvantage. Accordingly, a new version with an armoured roof, designated BTR-60PA, entered production in 1963. This new version's capacity was reduced from 16 soldiers to 14 soldiers. The appearance of the German HS.30 APC, which was armed with a 20 mm cannon, prompted the addition of the conical BPU-1 turret. This turret, which was originally developed for the BRDM-2 amphibious armoured scout car, was armed with the KPVT 14.5 mm heavy machine gun and a PKT 7.62 mm tank machine gun. The new vehicle was designated the BTR-60PAI and entered production in 1965. It was, however, quickly replaced by the BTR-60PB, which had a better sighting system for the machine guns. In the BTR-60, the crew compartment is located in the front of the vehicle and had a roof - unlike the troop compartment, which first received one with the introduction of the BTR-60PA. In the BTR-60P and BTR-60PA, the crew consists of a driver and a commander. The driver's seat is on the left and commander's seat is on the right. In the BTR-60PAI, BTR-60PB and BTR-60PZ, the crew consists of a driver, a commander and a gunner. The position of the driver and commander stations remained unchanged in later models. The gunner operates the BPU-1 turret, using the PP-61A optical sight. In the BTR-60P, both the driver and commander manned their positions by entering the vehicle through the sides. The BTR-60PA introduced two hatches over their stations and crew members had to climb on top of the vehicle to use them. The entry method did not change in later production models. The BTR-60B introduced a side door for the gunner on the right side, and firing ports for both the driver and commander, and two for the gunner, one on each side. (For more information on the BTR-60's firing port see the troop compartment section). Both the driver and the commander have forward views through bulletproof windshields, onto which steel covers can be lowered. In the BTR-60P and BTR-60PA, the covers had vision slots, and additional slots on both sides of the crew compartment. These were removed in the BTR-60PB in favor of two periscopes on each side. [clarification needed] In early models of the BTR-60P and BTR-60PA, only the driver had a periscope, while the commander had a removable OU-3 infrared searchlight. In the BTR-60PB, both the driver and the commander have three periscopes in the front (the commander's center periscope can be hard to see as it's just below the OU-3 infrared light). The vehicle was usually equipped with an R-113 radio; however,some models used the R-123. The initial BTR-60P production model lacked night-vision and had only four headlights (two infrared, two white, one of each kind per side, these remained in all BTR-60 models). Late BTR-60P models were fitted with night-vision; the TKN-1 connected with the OU-3 infrared searchlight for the commander and the TWN-2 for the driver. This remained unchanged in later models. The troop compartment is behind the crew compartment and in front of the engine compartment. The BTR-60P can transport up to 16 fully equipped soldiers. This number reduced to 14 in BTR-60PB. As the BTR-60P didn't have a roof, it was covered with a tarpaulin when traveling in bad weather conditions. It was also covered with bows and canvas. Also, all BTR-60 models had three firing ports on each upper side of the hull through which the infantry being transported could fire at the enemy with their personal weapons. The difference between models was in the position of these three firing ports. The BTR-60P and BTR-60PA had the firing ports positioned in a row between the middle and the front part of the troop compartment. In the BTR-60PB, the firing ports were relocated; one was next to the driver and commander, one next to the gunner and one in the side of the troop compartment. Because of the engine placement (in the rear of the vehicle), transported infantry must mount and dismount through the sides in the BTR-60P or through the roof hatches in the roofed BTR-60PA, BTR-60PB, and BTR-60PZ variants. 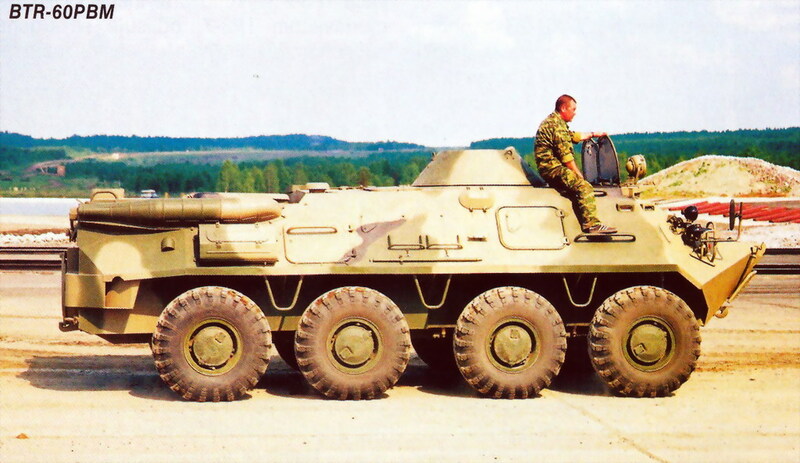 To help the infantry to mount and dismount the vehicle, the BTR-60P had two steps on each side of the hull, one between the first and second pair of road wheels and the other between the third and fourth pair of wheels. It also had two vertical hand rails on each side of the troop compartment, as well as an angled horizontal one on the left-hand side of the hull next to the engine compartment. The BTR-60PA introduced yet another step on each side of the hull between the second and third pair of wheels, as well as six horizontal hand rails on each side of the vehicle, three on the lower side and three on the upper side. The vertical ones were removed, while yet another angled horizontal one was added on the right-hand side of the hull next to the engine compartment. In the BTR-60PB, the number of hand rails decreased from six to five on each side of the hull; the rear upper hand rail was removed from he right side, whereas the center upper one was removed from the left side. The BTR-60P has two doors on each side of the troop compartment (one in the front and one in the rear), but infantry still had to dismount through the sides. The side doors were removed in the BTR-60PA. They were used mostly as emergency exits and as auxiliary firing ports. In the BTR-60PB, a side door was added on the front left of the troop compartment. The BTR-60 has a 8x8 suspension. Originally, there were difficulties in finding a suitable engine for it: the six-cylinder GAZ-40P gasoline engine, which produces 90 hp, had insufficient power, while the 205-hp YaAZ-206B was too heavy. Instead, the BTR was fitted with two six-cylinder gasoline GAZ-40P engines (67 kW) located side by side in the rear of the vehicle. The combined power of the engines is 180 hp (134 kW). Each engine propels two of the vehicle's axles. The engine on the right propels the second and the fourth axles, while the one on the left propels the first and the third axles. Each engine has its own four-speed gear box with a single-shielded hydraulically controlled clutch and an exhaust. Each axle has its own differential and is hung on transversal torsion bars. The first two axles each have two hydraulic absorbers, while the third and fourth only have one. The first and second pair of wheels can be turned. The gaps between the first and second axles and between the third and fourth axles are even. The gap between the second and third axles is slightly larger than the other ones. The two-engines setup has an advantage in the fact that each engine could work without the other. This means that, if one engine is disabled, it doesn't affect the other one and the vehicle can still move, albeit with reduced speed. This setup, however, caused several problems that either do not exist in single-engined vehicles or weren't as serious: the design itself was complicated and the amount of work that had to be done during exploitation and repair was higher than in vehicles with a single engine. The engines themselves were originally intended for truck use, which meant that they were working in extreme conditions not originally envisioned for them. Because of this, engine breakdowns were frequent. The vehicle also used large amounts of fuel and caught fire easily. Despite all this, the two-engines setup was used in all BTR-60 production models as well as most variants of the BTR-70. The single-engine setup was introduced in the BTR-80. Ex-Egyptian or ex-Syrian BTR-60PB, in the Yad la-Shiryon museum, Israel, 2005. Notice the exposed water jet with both of its lids opened. BTR-60s were produced by Gorkovsky Avtomobilny Zavod (GAZ). The BTR-60P was produced between 1960 and 1963. The BTR-60PA entered production in 1963, followed by the BTR-60PA-1 in 1965. Both the BTR-60PA and BTR-60PA-1 were produced until 1966. The BTR-60PAI also entered production in 1965, but was quickly replaced in 1966 by the BTR-60PB, which had a better sighting system for the machine guns. The BTR-60PB remained in production until 1976, when it was superseded by the BTR-70. According to Western estimates, around 25,000 BTR-60s were produced by GAZ. During BTR-80 production, and therefore after BTR-60 production had ended, there was a special production run of 100 BTR-60PBs, some of which have been exported to Iraq. An order to enter the BTR-60P into Soviet Army service was issued on 13 December 1959. However, production didn't start until 1960. The first BTR-60Ps were delivered in 1960. It first entered service with the Soviet Army and later the Soviet naval infantry. The BTR-60 entered service with the Soviet military at the time when the USSR was arming on a mass scale. In the early 1960s, it replaced the BTR-152 in the role of the basic APC. The BTR-60P was first seen by the West in 1961. The BTR-60PA entered service with the Soviet Army in 1963, the BTR-60PA-1 and BTR-60PAI entered service in 1965, the BTR-60PB in 1966, the BTR-60PZ in 1972 and theBTR-60PBK in 1975. As newer models of the BTR-60 appeared, the older ones were gradually withdrawn from front-line service. A number of old BTR-60Ps were converted into repair vehicles. The first use of Soviet BTR-60s during a conflict happened during the Warsaw Pact 1968 Invasion of Czechoslovakia. However, actual combat was scarce. In the 1980s, most of the BTR-60s in the Soviet army had been replaced by the BTR-70 and BTR-80; however, a large number was still operated by second-line and border troops. According to the data provided by the USSR during the signing of the CFE Treaty in 1990, there were 4,191 BTR-60s in service with the units stationed in the European part of the Soviet Union. The first real combat use of the BTR-60 took place during the Sino-Soviet border conflict on Zhenbao Island (Damansky Island at the time) in March 1969. The frontier units operating on the island were equipped with BTR-60PBs, while the 57th border detachment group was equipped with BTR-50Ps and BTR-50PKs. The BTR-60 proved to be a good vehicle, although it sustained high losses due to the large number of RPGs used by the Chinese and mistakes made by the commanders of the APCs, which originated from the low amount of experience in combat use of the new vehicles. The high losses due to RPG hits wasn't unexpected, as the BTR-60's armour was designed to protect the vehicle from small arms fire and shrapnel, and not specialized anti-tank weapons. The most effective tactic found for using BTR-60PBs was in covering the dismounted infantry. This is a job more suited for infantry fighting vehicles than armoured personnel carriers, whose main role is transporting infantry to the battlefield and providing them with armour protection during that time - however, it must be noted that the BMP-1, the world's first infantry fighting vehicle, started production in 1966 and therefore Soviet Army had very small numbers of those vehicles available at the time of Sino-Soviet border conflict. During the fights in March, the Chinese managed to capture four BTR-60PBs and one T-62 MBT. BTR-60PBs were used again during the border conflict east of Lake Zhalanashkol in Kazakhstan (Kazakh SSR at the time) in August 1969. During the fighting, the armour of BTR-60PB proved inadequate. A rusting BTR-60PB abandoned in the center of a village in Afghanistan's Oruzgan province. The BTR-60PB was used in large numbers during the initial part of the Soviet War in Afghanistan. This was because the units that were originally used for this operation weren't the top priority of the Soviet military, which prioritized the units stationed in East Germany. The same design flaws were present during this conflict and the vehicle became even more vulnerable due to the kind of fighting that took place in Afghanistan. The GAZ-40P gasoline engines experienced frequent power losses and overheating due to the tropical highland climate that they were not well suited for. Also, the BTR-60PB's turret could not elevate its armament high enough to fire at the Mujahideen attacking from high ground. Like during the Sino-Soviet border conflict, many BTR-60PBs fell victim to RPGs. Because of those drawbacks, the BTR-60PBs were replaced by BTR-70s as soon as possible to a point were only the BTR-60 command variants were used. Soviet BTR-60s, BTR-70s and BTR-80s were used for dispersing the demonstrations in Tbilisi in 1989 and stopping the fighting on the border between Uzbek SSR and Kirghiz SSR. They were also used in Nagorno-Karabakh and South Ossetia. In 1990, they were used in Vilnius to suppress the Lithuanian independence movements. In 1991, the BTR-60s of the Soviet Army was passed on to the armies of the successor states and thus used in many regional conflicts. 27 BTR-60PBs that were inherited by Moldavia were used by its army during the War of Transnistria. A number of BTR-60s were used by the Georgian army during the 1992–1993 War in Abkhazia. As of 2007, several hundred BTR-60s remain in service with USSR successor states; these are in a process of being replaced by more modern vehicles. Russia used BTR-60s during the First Chechen War, but since the mid-1990s BTR-60s have only been in use with the border troops. In Russian service, many BTR-60 variants have been replaced by variants of the BTR-80/K1Sh1 or have been upgraded with the engines from the BTR-80. Moldova inherited 27 BTR-60PBs from the Soviet Union. They were used during the War of Transnistria against the Pridnestrovian Moldavian Republic. Moldova also ordered 161 ex-Romanian TAB-71Ms in 1992, which were delivered between 1992 and 1995. Moldova also inherited 20 BTR-70s from the Soviet Union and received 250 TAB Zimbrus and MLI-84s from Romania. In the end of March 1992, the Moldavian army was trying to sever the connection between Tiraspol and Rîbniţa. Five out of the six BTRs used during that operation were lost. On 1 April, two BTRs were used during the assault on Bender. In June, dozen of APCs were used during another assault on the city. In 1992, the separatist state of Abkhazia declared Independence from Georgia and the War in Abkhazia (1992–1993) began. Georgia sent its troops to Abkhazia to stabilize the region. The 3,000 man force was poorly equipped with military vehicles, having only five T-55 main battle tanks, a few BMP-2 infantry fighting vehicles, three BTR-60/70 armoured personnel carriers and a small number of BM-21 Grad MRLs. As the war continued, the Georgian forces in Abkhazia were strengthened. The rebels had no AFVs of their own, but captured some heavy equipment from the Georgians. BTR-60PB of the Armenian police enters Shahumyan Square near the French Embassy in Yerevan, Armenia on 1:30 pm, 1 March 2008. A BTR-60PB of the Armenian police was used on 1 March 2008 during the Armenian presidential election protests in Yerevan. It was sent to counter the protest at the Shahumyan Square near the French Embassy, where it arrived at 1:30 pm. Eventually, the unarmed and peaceful demonstrators surrounded the APC, mounted it, and forced its crew to leave the square. During the ongoing War in Donbass, Ukrainian Military used several BTR-60 variants. The Ukrainian National Guard, have deployed BTR-60PB's for counter-insurgency operations in Eastern Ukraine. BTR-60 APCs were employed widely both by the Soviet Army and by more than 30 export customers. Operators of the BTR-60 have included Afghanistan, Algeria, Angola, Bhutan, Botswana, Bulgaria, Cambodia, Congo, Cuba, Djibouti, East Germany, Ethiopia, Finland, Grenada, Guinea, Guinea-Bissau, Hungary, India, Iran, Iraq, Laos, Libya, Mali, Mongolia, Mexico, Morocco, Mozambique, Nicaragua, North Korea, Romania, Soviet Union, Syria, Uganda, Vietnam, Yugoslavia, Yemen, and Zambia, as well as many of the successor states of the Soviet Union. The most widely spread model is the BTR-60PB. Although the BTR-60 still remains in service with many of the world's armies, it is almost never used as an APC any more. They are still being used as mobile command posts, artillery forward observation posts, airplane guidance posts, communication posts and many other specialized roles. The BTR-60 has seen action in the Yom Kippur War, the 1971 War between India and Pakistan (where it was used very effectively to punch a hole through to Jessore and subsequently Khulna), the Soviet invasion of Afghanistan (where it was used by both the Soviet and Afghan government troops), the Chechen and Yugoslav wars. It was also used by Warsaw Pact forces during the 1968 Warsaw Pact invasion of Czechoslovakia. Finland's Jäger battalions operated Soviet-built BTR-60R-145BM "Chaika" vehicles. These were upgraded to BTR-60PUM standard between 1996 and 1997. In 1991, seven conscripts of the Karelia Brigade drowned when their BTR-60 sank at Taipalsaari during an amphibious exercise because the vehicle was loaded incorrectly (top-heavy) and the roof hatches opened. The usual nicknames for BTR-60 amongst the Finnish conscripts were Petteri (a male name), after the initials BTR, and Taipalsaaren sukellusvene (Taipalsaari Submarine) after the 1991 incident. Polish-modified BTR-60PB of the Polish Police on Tamka Street in Warsaw, Poland during European Economy Summit 2004. Notice the lack of armament. Milicja Obywatelska (MO) operated several BTR-60PAs. They were used by ZOMO riot control units. The Polish Army also received a dozen BTR-60PU-12s, which were used within the Soviet supplied 9K33 Osa SAM regiment delivered between 1980 and 1985. On 7 December 1981, the delegation of the Polish Ministry of Internal Affairs went to the Soviet Ministry of Internal Affairs asking for equipment and supplies necessary to equip around 60,000 MO operatives and reservists enlisted because of the intensified activities against the Communist government. In response, on 17 December, the Soviet Ministry of Internal Affairs decided to transfer 25 BTR-60PBs along with 10,250,000 "Czeromucha" incapacitating chemical devices and 2,000 tonnes of gas over to its Polish counterpart. These vehicles had previously been used in Afghanistan. They were later modified by adding another radio set. They were used by ZOMO. During the martial law in Poland, the MSW automobile plant in Łódź fitted some BTRs with breakers mounted on the front of the vehicle, which were used for clearing obstacles (See Poland section in the Variants section for details). When the Milicja Obywatelska was transformed back into Policja in 1990, all BTR-60PBs had their armament removed. This was because Policja, unlike MO, didn't have a need for weaponry with such a high muzzle velocity - such weapons were dangerous to use in urban areas. The MO needed such weaponry because it was also supposed to carry out anti-partisan operations. Policja used unarmed BTR-60PBs for security during European Economy Summit 2004 in Warsaw, as well as for clearing blockades set up by the Samoobrona political party. A few Police BTR-60PBs are kept in storage for anti-riot duty as barricade breakers. PRC reversed engineered the BTR-60PB after capturing four examples during the Sino-Soviet border conflict on Zhenbao Island in March 1969. The program was completed in the late 1970s. However, the vehicle did not enter service in large numbers because the PRC's primitive road system and rugged terrain meant that the wheeled APC wasn't well suited for the Chinese conditions as it lacked the cross country capability of the tracked APCs in the Chinese inventory. It should be noted though that, before the Sino-Soviet split, the PRC imported 100 BTR-40s and 100 BTR-152s from the USSR and manufactured copies of those vehicles; and these served with the PLA until the mid-1990s. The experience gained through reverse-engineering the BTR-60 helped the PRC in developing other more advanced wheeled APCs later in the 1980s. BTR-60PB APC of the Soviet-controlled Democratic Republic of Afghanistan passing by a halted column of Soviet BTR-80s, 1988. BTR-60PB captured by Israel during the Yom Kippur War. This example now resides at the IDF History Museum, Tel-Aviv. Three assaulting BTR-60P APCs and supporting the entrenched infantry. BTR-60P (1959) (P stands for plavajushhijj – "swimming") – Initial version with troop compartment completely exposed and often covered with bows and canvas. The vehicle has mounting points for three 7.62 mm machine guns (either the PKT, the SGMB or the PKB tank/medium/general-purpose machine guns), one on the front and one on each side between the two small doors; however, only one mount is fitted, and that is usually on the front mounting point. The vehicle carries 2,000 machine gun rounds. It was also known under the designation GAZ-49. BTR-60P with a modified machine gun mounting point in the front to fit the DShK 1938/46 12.7 mm heavy machine gun like in BTR-60PA instead of the 7.62 mm machine gun. The vehicle carries 500 rounds for the DShK 1938/46 12.7 mm heavy machine gun and 3,000 rounds for 7.62 mm machine guns. BTR-60P converted into a command vehicle equipped with a rail-type antennae running around three sides of the hull top. BTR-60P M1961/1 – BTR-60P converted into a fire support vehicle. It is fitted with the turret from the PT-76 amphibious light tank. Most probably prototype only. BTR-60P M1961/1 fitted with a smaller version of the PT-76 turret. Most probably prototype only. BTR-60P M1961/2 – BTR-60P converted into a fire support vehicle. It is fitted with a small open-topped turret armed with a 37 mm gun with clean barrel with conical flash-hider. Most probably prototype only. BTR-60P converted into a mortar carrier. It can carry up to two mortars, along with their crews and ammunition. MTR-2 – BTR-60P converted into a repair vehicle with a raised tarpaulin cover over the troop compartment running almost to the rear. BTR-60PA (1963) – This version has an armoured roof over the troop compartment. It is fitted with improved 'closed-down' vision devices for the crew. Behind the commander's and driver's hatches is a single rear-opening rectangular hatch in front of which is a single mount for the DShK 1938/46 12.7 mm heavy machine gun between the two circular crew hatches at the front of the personnel compartment and two optional mounts for 7.62 mm machine guns (either the PKT, the SGMB or the PKB tank/medium/general-purpose machine guns) on each side of the roof of the personnel compartment. Early production BTR-60PAs only had a single mount for the 7.62 mm machine gun between the two circular crew hatches at the front of the personnel compartment. The small doors on each side of the hull that were present in the BTR-60P were removed. The BTR-60PA introduced collective NBC protection system to the series. It has six handrails on the each side, in rows of three. The personnel compartment has two rectangular hatches. The fact that the roof has been added makes passengers more vulnerable to enemy fire while they're exiting the vehicle through the top hatches. Also, the gunner must be at least shoulder high out of the vehicle to operate the weapons. The vehicle carries 500 rounds for the DShK 1938/46 12.7 mm heavy machine gun and 3,000 rounds for 7.62 mm machine guns. The weight of the vehicle increased from 9.8 tonnes to 10.2 tonnes. It was also known under the designation BTR-60PK, where K stands for krisha – "roof" and GAZ-49A. BTR-60PA-1 (1965) – Upgraded BTR-60PA with improved power plant and transmission and the R-123 radio instead of the R-113. The weight of the vehicle increased from 10.2 tonnes to 10.3 tonnes. It entered service in very small numbers. BTR-60PA converted into a command vehicle equipped with two side-mounted angled telescopic masts. MTP-2 (MTP stands for mashina tekhnicheskoj pomoshchi) – BTR-60PA converted into a technical support vehicle based on the BTR-60PA. It is equipped with a crane mounted on the front of the hull. While in transport, the crane is carried on the left-hand side of the vehicle. It's also fitted with several stowage boxes, two on the roof behind the front hatches, one smaller on the front of the right-hand side of the hull and two over the engine decks. It is also missing two or three hand rails. BTR-60PAI (1965) – Initial version with the DShK 1938/46 12.7 mm heavy machine gun replaced by the conical BPU-1 turret from the BRDM-2, which is armed with the KPVT 14.5 mm heavy machine gun and the PKT 7.62 mm coaxial tank machine gun, on the top of the vehicle. The turret is placed over the second axle. The two remaining mountings for 7.62 mm machine guns on the upper hull sides were removed. Since the turret has been added, the crew had increased from two to three (commander, driver, and gunner). There are two semicircular hatches for the crew in front of the turret. The vehicle carries 500 rounds for the KPVT 14.5 mm heavy machine gun and 3,000 rounds for the PKT 7.62 mm coaxial tank machine gun. BTR-60PB (1966) – Improved sighting system for 14.5 mm KPVT heavy machine gun and improved GAZ-49B engine. The turret was modified to include a new telescopic sight, the 14.5 mm KPVT heavy machine gun and the 7.62 mm PKT coaxial light machine gun were moved to the right, while the telescopic sight was mounted coaxially to the left. The armour protection has also been improved. The frontal armour of the BTR-60PB can withstand fire from 7.62 mm bullets from any range, while the rest of its armour can withstand fire from 7.62 mm bullets from 100 m. It has a filtration and over pressurization system for NBC protection. It also has self-sealing tires, a central tire inflation system and antennae mount on the right hand side of the rear of the roof. It has a side door in the left side of the front part of the troop compartment. Some BTR-60PBs also lack one of the firing ports on the left side of the hull. Late production BTR-60PBs have the same sighting improvement as the BTR-70, which consists of a small additional episcope sight, which faces to the rear on the turret roof. The vehicle carries 500 rounds for 14.5 mm KPVT heavy machine gun and 3,000 rounds for 7.62 mm PKT coaxial light machine gun. It was also known under the designation GAZ-49B. BTR-60PB produced during the BTR-80 production run. It has a side door in the right side of the front part of the troop compartment. BTR-60PB converted into an agitation and propaganda vehicle. It is fitted with the same turret as the BTR-70ZS. BTR-60PB converted into a command vehicle equipped with two side-mounted angled telescopic masts. GAZ-4907 – BTR-60PB converted into a specialized chassis used by a few command variants. BTR-60PBK (K stands for komandnyj – "command") (1975) – Company commander version, based on the specialized chassis GAZ-4907. This version is equipped with three radio sets (two R-123 and one R-148), as well as three whip antennas and an antenna mast on the left upper hull. Late-production models have a modified turret and additional Pin Stick antenna. BTR-60R-145BM "Chaika" – Turret-less command vehicle, based on the GAZ-4907 chassis and fitted with a collapsible AZI frame antenna, the AMU 10 m high telescopic mast, the AB-1-P/30 generator, five radio sets (one R-123MT, one R-130, two R-111 and one R-012M) as well as the TA-57 field telephone. It is also known under the designation BTR-60PU. BTR-60R-149BM – Command vehicle based on BTR-60R-145BM-1. BTR-60PZ (zenitnyj) (1972) – Version with an improved turret similar to that on the BTR-70, which can be used to fire at flying targets. It's equipped with the 1PZ-2 roof-mounted periscope mounted on the turret. The armament has a high angle of elevation. It entered service in very small numbers. BTR-60 1V18 "Klyon-1" – BTR-60PB converted into an artillery command and forward observer vehicle, used by battery commanders of units equipped with towed artillery and MRL systems. The original turret has been replaced by an unarmed one ("Darth Vader") with the NNP-21 and DV observation devices and a rangefinder. Other specialized equipment comprises the UD-15G internal generator, four radio sets (three R-123M and one R-107M), as well as the 1V510 computer, the PUO-9M fire control set and the PAB-2A aiming circle. Crew consisted of five soldiers. Each 1V17 "Mashina-B" set consists of three 1V18s, one 1V19 (qv), three 1V110s (based on GAZ-66) and one 1V111 (based on ZiL-131). BTR-60 1V18-1 – Modernized model. BTR-60 1V19 "Klyon-2" – BTR-60PB converted into an artillery fire direction center externally identical to the BTR-60 1V18 but provided with the R-130M radio set and an additional stowage box on each upper side of the hull. Used by battalion commanders. BTR-60 1V19-1 – Modernized model. BTR-60 R-145BM – BTR-60PB converted into a turret-less communications vehicle and equipped with five radio sets: two R-111 or R-171, one R-123 or R-173, one R-130M, and one R-012M. BTR-60PU-12 (9S482) (punkt upravleniya) (1972) – BTR-60PB converted into an air defense command vehicle and used by units equipped with ZSU-23-4, SA-9 or SA-13. The turret was removed and the vehicle was fitted with the AMU telescope mast on the right side of the front hull roof and the AB1-P/30 1 kW generator on top of the blanking plate. The vehicle is equipped with the 1G13 gyroscope, the KP-4 navigation apparatus and the ASPD-12 computer. Often, the PU-12 is connected to a radar and the radar image is directly visible on the vehicle's IT-45 monitor. BTR-60PU-12M can process up to 12 targets. BTR-60PU-12M (9S482M) – Modernized model developed in the 1980s for units equipped with more modern SAM systems. This model is equipped with the more modern ASPD-U computer instead of the ASPD-12 and with the S 23-1 data processing unit connected to the MP-21, MP-22, Strela-10M, Osa-AK etc. BTR-60PU-12M can process up to 99 targets instead of only 12. BTR-60R-975 – Vehicle used by Tactical Air Control Parties, equipped with four radio sets (R-123, R-134, R-853 and R-864), as well as the SMI-2 km beacon system (protected by a conical cover during transport) and the G-290B generator. It has two blade antennas on the rear of the deck. BTR-60R-975M1 – Modernized version. It doesn't have the conical cover for the beakon system. BTR-60R-137B – BTR-60PB converted into a USW signals vehicle similar to the BTR-60R-140BM. It is equipped with two radio sets: R-123 and R-405. It also has a frame antennae around the top of the hull and a telescopic mast on the right side of the front of personnel compartment's roof. BTR-60R-140BM – BTR-60PB converted into a SW signals vehicle similar to the BTR-60R-137B. It is equipped with three radio sets: R-140, R-405, R-123. BTR-60R-156BTR – BTR-60PB converted into a HF signals vehicle used on the operational level. It is equipped with the R-156 HF radio and two other radio sets: R-405 and R-123. BTR-60R-409BM – BTR-60PB converted into a radio relay station similar to the BTR-60R-419BR equipped with the R-409 radio set. BTR-60R-419BR – BTR-60PB converted into a low-frequency radio relay station similar to the BTR-60R-409BM. BTR-60E-351BR – BTR-60PB converted into a battery charger vehicle used by signals units. It is equipped with a 20 kW generator. The vehicle has an extra seat and carries fuel inside for the generator. BTR-60P-238BT – BTR-60PB converted into a switchboard vehicle (kompleksnaya apparatnaya telegrafnoj svyazi). BTR-60P-239BT – BTR-60PB converted into a switchboard vehicle (kompleksnaya apparatnaya telegrafnoj svyazi). BTR-60P-240BT – BTR-60PB converted into a switchboard vehicle (kompleksnaya apparatnaya telefonnoj svyazi). BTR-60P-241BT – BTR-60PB converted into a switchboard vehicle (kompleksnaya apparatnaya telegrafnoj svyazi). BTR-60MS – BTR-60PB converted into a communications Vehicle fitted with a "High Ball" antennae mount. BTR-60MBP (MBP stands for mashina boyevogo posta) – BTR-60PB converted into a base security vehicle for Strategic Rocket units. The original turret has been replaced by a new type armed with NSVT 12.7 mm heavy machine gun and equipped with an improved 1PN22M1 sight, loudspeakers, OU-3GA-2 IR search lights and additional TNPO-170 periscopes. The vehicle is also equipped with a stowage box on the right side of the hull. Behind the right side troop compartment roof hatch, there's a small bolted on plate. BTR-60PBM – BTR-60PB modernization fitted with a new engine in a new, bigger engine compartment similar to the one in the BTR-80. The exhaust pipes are also similar, if not identical, to the ones in BTR-80s. The right side of the hull has been altered: a side door with a small hand rail for the troop compartment was added, four out of five handrails were removed (the exception being the lower front one), the firing ports were replaced with one located next to the gunner's station and a stowage box was added next to the engine compartment. The modernization is done by the Arzamas Engineering Plant. 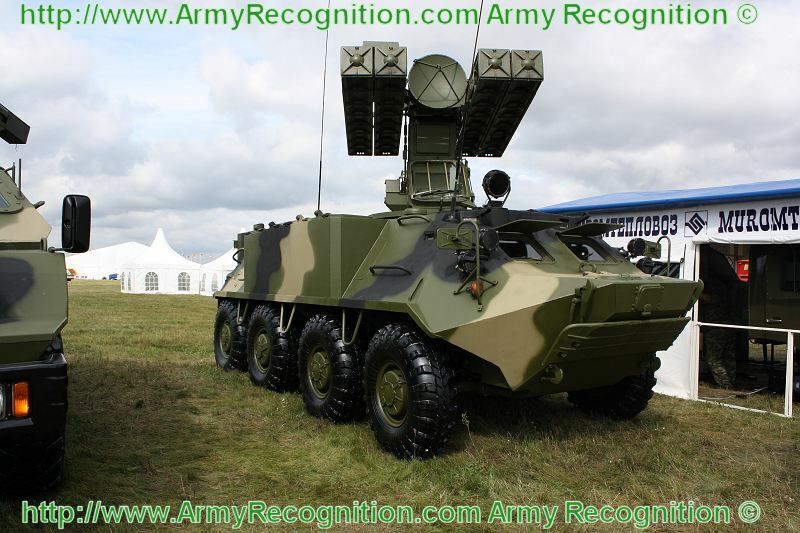 MWS – Another upgrade of the BTR-60 was developed by Muromteplovoz JSC. This one is powered by the YaMZ-236A 195 hp diesel engine in a much bigger engine compartment, with a service hatch on the rear side and only one exhaust pipe, on the left side. The first prototype – sometimes called BTR-60BD – was in fact an upgraded R-145BM command vehicle. The vehicle that was shown during IDELF-2006 in Moscow was a modified BTR-60PB with the original machine gun turret replaced by the MB2 modular turret with a 2A42 30mm gun. MWS-M – MWS with altered sides of the hull. On the left side, two handrails were removed (the center lower and the rear lower) and a stowage box was added in the center. On the right side, two handrails were removed (the center upper and lower), a new handrail was added to the upper rear. The firing ports were removed on both sides. The latest upgrade was shown for the first time during MAKS-2011. This version also has a new diesel engine, the YaMZ-236D (as found on the BTR-70D upgrade), but here the engine compartment has been relocated to the center of the hull. The troop compartment with eight seats is now at the very end of the hull, has a raised roof line and two exit doors. There are no periscopes for the infantry squad and only two firing ports, in the rear doors. On top of the troop compartment is a new MA7-02 turret. This turret is fitted with a 1PZ-7A sight and armed with a 12.7 mm machine gun "Kord", an automatic grenade launcher AG-17, a coaxial machine gun PKTM 7.62 mm and 81mm smoke grenade launchers 902V. 9K35M3-K "Kolchan" – During MAKS-2007, Muromteplovoz showed a SAM launch vehicle, based on an upgraded BTR-60 and armed with the Strela-10 launcher fitted to the hull roof. Irtish – BTR-60PB converted into civilian repair vehicle. It has a crane mounted in the front of the hull and a crate on top of the hull. The turret was removed. It is also missing two hand rails, one in the center of the upper side of the hull and one in the center of the lower side of the hull. The firing ports are blocked. The steel covers for the windshields are removed. The periscopes were removed. A window was added on the front part of each side of the hull. BTR-60PB converted into a civilian armoured firefighting vehicle. The turret and center hand rails were removed and all firing ports were blocked. The steel covers for the windshields were removed, as were the periscopes. A window was added on the front part of each side of the hull. It was fitted with a crate on top of the hull. BTR-60PPM – BTR-60PB converted into a civilian armoured firefighting vehicle. The turret and center hand rails were removed, as were the steel covers for the windshields. The firing ports were all blocked, as were the periscopes. Three windows were added on each side of the hull. It was fitted with a crate on top of the hull. It also carries an A-crane on the right side of the hull. BTR-60PB-MD1 on the Army day parade in Sofia, 6 May 2009. BTR-60PAU – BTR-60PA converted into an artillery command vehicle equipped with 4 whip antennas. BTR-60PB experimentally fitted with the Polish WAT turret from SKOT-2AP. Only a prototype was made. BTR-60PB-MD (bronyetransport’or moderniziran ) – BTR-60PB modernization fitted with the VAMO DT3900 or Rover TD-200 diesel engine, four MB smoke grenade launchers on the turret (two on each side), "Melopa" night sight, new day sight, new NBC protection system, modern radios. It also has a rear view mirror on the left hand side of the hull and side hatches. Only a prototype was made. BTR-60PB-MD1 – BTR-60PB-MD variant developed for the Bulgarian army, fitted with the Cummins ISB 25.30 turbocharged diesel engine developing 250 hp (186 kW), additional protection for its headlights and eight smoke grenade launchers on the turret (four on each side). 150 in service. BTR-60PB-MD3 – Export BTR-60PB-MD variant fitted with the KamAZ diesel engine, different sights, eight smoke grenade launchers in right-hand corner of the front of the hull and six on the turret (three on each side). It is also known under the designation BTR-60PB-MD2. The prototype, shown in 2004, was based on the BTR-60PA. BTR-60PB fitted with a turret from the BMP-1. It also lacks the hand rails on the upper side of the hull. BTR-60PB armed with 100 mm gun in a heavily modified turret from the T-54. The hull is modified as well since the two hand rails on the side of the hull are gone and the other two are moved to the center of the hull between the upper and lower parts of the side of the hull. The lights in the front received armoured protection. The vehicle has two rear-view mirrors in the front corners of the hull (one on each side) The chassis has also been modified as the vehicle has a BTR-80 style straight chassis with no slope near the engine compartment. Because of the size of the new turret the vehicle is most probably no longer an APC but an armoured car. BTR-60 armed with twin 23 mm anti-aircraft guns (probably ZU-23-2). It is designed to be used for anti-aircraft purposes. BTR-60 armed with twin 37 mm anti-aircraft guns. It is designed to be used for anti-aircraft purposes. BTR-60PB with its turret replaced by the one used in French AML-90 light armoured car. Only one BTR-60PB was converted and it was done so to make use of a spare turret after the original AML-90 hull was destroyed in a road accident. BTR-60PB fitted with stowage racks over the engine decks. BTR-60PUM – BTR-60R-145BM "Chaika" upgrade with new communication equipment and armed with the NSV 12.7 mm heavy machine gun. Finland bought later two BTR-80s for testing out a replacement but ended up buying the domestic XA-180 series of vehicles, known later as Patria Pasi. SPW-60P (SPW stands for Schützenpanzerwagen) – NVA designator for BTR-60P. SPW-60PA (SPW stands for Schützenpanzerwagen) – NVA designator for BTR-60PA. SPW-60PA(S) – SPW-60PA converted into a staff vehicle. SPW-60PB (SPW stands for Schützenpanzerwagen) – NVA designator for the BTR-60PB. SPW-60PB(ABS) (ABS stands for Artillerie-Beobachtungsstelle – "Artillery-Monitoring Center") – SPW-60PB converted into an artillery forward observer vehicle with 4 whip antennas (2 on the rear of the engine deck's roof), two small brackets on the top of the upper left-hand side of the hull with striped poles stowed, commander's and driver's hatches that fold forward horizontally and a modified commanders position with retractable observation device. SPW-60PB(BBS) (BBS stands for Batterie-Beobachtungsstelle – "Battery-Monitoring Center") – SPW-60PB converted into a command vehicle for air-defense artillery batteries. Similar to the SPW-60PB but it has two whip antennas on the rear hull. SPW-60PB(S) – SPW-60PB converted into a command vehicle. NZ(B) MSR/PR (NZ stands for Nachrichtenzentrale) – SPW-60PB converted into a signals vehicle for motorized rifle and tank regiments. It is equipped with the R-123M, R-123MT and R-405 radio sets, the AB-2-0 generator mounted behind the turret and the F-1301 electronic telegraph. Turret has been blanked-off. LBGS(B) (LBGS stands for Leitungsbaugerätesatz) – SPW-60PB converted into telephone cable layer. It is also known under the designation LBT. R-137B – SPW-60PB converted into a signals vehicle. Differs externally from Soviet type and has some components from local production including the FF63M field telephone set. R-140BM – SPW-60PB converted into a signals vehicle equipped with R-140M SW radio set, two movable whip antennas in the rear, a 10 m high telescopic mast and the AB-4-T/230-M1 generator. It differs externally from its Soviet counterpart and incorporates some components produced locally including the EKD 315 SW receiver. R-409BM – SPW-60PB converted into a radio-relay station equipped with 2 R-409MA semi-sets, free receivers: the R-326, the R-123MT, the P-303-OB and the AB-2-0/230-M1 generator. R-145BM/AKL1 – SPW-60PB converted into a signals vehicle. It is a R-145BM equipped with an additional R-870M set. R-145BM/AKL2 – Signals vehicle. As R-145BM but with additional R-809M2 set. Sedad - Version of the BTR-60PB with the turret replaced with a 23mm ZU-23-2 cannon installed with an optical device and CCD camera to allow the gunner to fire from inside the vehicle with day/night firing capability. BTR-60PB fitted with the CARDOM 120/81 mm mortar system in its troop compartment. The turret and the roof over the troop compartment have been removed. The roof over the crew compartment along with both hatches remains. A ladder was added to at least one side of the hull to allow easier mounting and dismounting. It was designed by Soltam. BTR-60 upgrade designed by Nimda fitting it with new power unit and automatic transmission which improves both mobility and reliability. BTR-60 modernization designed by Saymar. Following operations are carried out as a part of this modernization: Removing of all of the vehicle's systems and parts. Adding a bolted on superstructure with two hatches in its front, going all the way from the front hatches to the engine compartment which is necessary to adapt the vehicle to the new systems and parts (The engine compartment now externally resembles the one Russian MWS however it doesn't have a service hatch in the back and is angled near the top, also it too has rear lights mounted on both sides of the engine compartment although the lights themselves are different.). Sand blasting and repainting the hull. Resembling the vehicle with new and improved systems and parts as well as installing a new split transfer box that includes a limited split differential and a monitoring system allowing driving in rough terrain and improving the cross-country capabilities. Replacing the two GAZ-40P petrol engines with a single Caterpillar diesel engine developing 300 hp. Fitting a number of new parts for the new engine including a clutch system, split gear case, axillary engine systems, cooling systems, air inlet system, exhaust system. Converting and adapting a new fuel system for the diesel engine and integrating new and bigger fuel tanks to increase the maximum operational range. Installing a new and advanced electrical system including an advance control panel as well as replacement of all internal and external lighting. Increasing the driver's field of view by installing a rear view camera with an LCD screen. Improving the man-machine interface. The vehicle is armed with a pintle-mounted M2 heavy machine gun in the front and a second machine gun of a smaller caliber mounted on a "ring" in the rear. The rear machine gun is controlled from the inside, uses the "ring" to move and can rotate a full 360°. The vehicle als has two whip antennas in the front part of the superstructure. The modernization can also be applied to the BTR-70. APC-70 – Turret-less APC used by the Mexican marines, based on a civilian variant of the BTR-60 without firing ports, periscopes and with additional bulletproof windows. Armament consists of a single machine gun (either the Heckler & Koch HK21 or FN MAG-58 7.62) or a Mk 19 grenade launcher. It is also known under the designation BTR-60PB-MX. APC-70 fitted with an A-frame crane. BTR-60PB copy designed through reverse engineering. BTR-60PB fitted with an additional radio set. BTR-60PB modified by the MSW automobile plant for use during the martial law in Poland by ZOMO fitted with a two-sided breaker, weighting 1.5 tonnes, mounted to the front of the vehicle and a counter weight mounted to the rear of the vehicle. The breaker itself is made out of rail tracks and a dozen mm thick plate. It also has an additional protection on the OU-3 infrared searchlight as well as aerial seatbelts for the driver and commander. A Soviet BTR-60PB APC (left) and a Romanian TAB-71 APC (right) on display at "King Ferdinand" National Military Museum. TAB-71 (TAB stands for transportor amfibiu blindat – "amphibious armored carrier") – Romanian license -produced variant of BTR-60PB fitted with two more powerful SR-225 gasoline engines developing 140 hp (104 kW) each instead of the old GAZ-40Ps. It is equipped with additional periscopes, a protected sight on the left side of the turret and a front-mounted winch with a capacity of 5.5 tonnes. TAB-71M – Modernized TAB-71 fitted with two Saviem 797-05 diesel engines developing 130 hp (97 kW) each from the TAB-77 APC in a larger engine compartment and "suicide hatches" between the 2nd and 3rd wheels. It also has horizontal engine decks and exhausts. It is also known as TAB-72. TAB-71A R-1450 – Command version of the TAB-71 with additional whip antennas. TAB-71A R-1451 – Signals vehicle with unarmed turret which has a small crane mounted on the front used to remove the heavy batteries. It also has a 1 kW generator on the hull roof. Radio equipment consists of the R-1451 and the R-401M. TAB-71A R-1452 – Externally identical to the former but with R-1452 set. TAB-71AR (AR stands for aruncător de bombe) – Self-propelled mortar platform armed with M-37M 82 mm mortar (100 rounds). The Soviet mortar might be replaced with a more modern Romanian design like the Model 77. The turret has been removed and the vehicle has a flat roof on the personnel compartment with circular two-piece hatch opening to sides. There's a mount for a machine gun on the rear of the mortar position. TERA-71L (tractor de evacuare şi reparat auto) – ARV equipped with a crane and a dozer blade. Abkhazia – 5 BTR-60s and BTR-70s. Afghanistan - 600 BTR-60PBs were ordered in 1978 from the Soviet Union and delivered between 1979 and 1986 (the vehicles were probably previously in Soviet service). A number of BTR-60s bought from Russia in 2002. 300 BTR-60s are currently in service. Algeria - 400 BTR-60PBs were ordered in 1977 from the Soviet Union and delivered between 1978 and 1981 (the vehicles were possibly previously in Soviet service). 10 BTR-60PU-12s were ordered along with 10 9K31 SAM batteries in 1979 from the Soviet Union and delivered between 1979 and 1980. At peak there were 530 BTR-60s in service. Currently 400 BTR-60s and OT-64 SKOTs are in service. Angola - 74 BTR-60PBs were ordered in 1975 from the Soviet Union and delivered between 1975 and 1976. 175 BTR-60PBs and BTR-60PB-based command vehicles were ordered in 1980 from the Soviet Union and delivered between 1981 and 1985 (the vehicles were probably previously in Soviet service, some could be BTR-50P). 250 BTR-60PBs and BTR-60PB-based command vehicles were ordered in 1987 from the Soviet Union and delivered between 1987 and 1988 (the vehicles were probably previously in Soviet service). 90 BTR-60s in service in 2000. 100 BTR-60s are currently in service. Armenia – 25 in service with the armed forces in 1994, 19 in 1995, 1996, 14 in 1997 and 1998, 11 in 1999, 2000, 2001, 2002, 2003, 2004 and 2006. 3 in service with the ministry of internal affairs in 1999, 2000, 2001, 2002, 2003, 2004 and 2006. 5 in service with the ministry of national safety in 1995, 1996, 1997, 1998, 1999, 2000, 2001, 2002, 2003, 2004 and 2006. Some in service with the police. Azerbaijan – 15 in service with the armed forces in 1992, 11 in 1993, 8 in 1994, 25 in 1995, 1996, 1997, 1998, 1999, 2000, 2001, 2002, 2003 and 2004 and 23 in 2006. 21 in service with the internal forces in 1992 and 1993, 2 in 1994, 3 in 1995, 1996, 1997, 1998, 1999, 2000, 2001, 2002, 2003, 2004 and 2006. 12 in service with the boundary forces in 1992 and 1993, 13 in 1994, 19 in 1995 and 1996, 14 in 1997, 1998, 1999, 2000, 2001, 2002, 2003, 2004 and 2006. Belarus – 221 in service in 1995 and 188 in 2000, 2003 and 2005. Botswana - 30 BTR-60PBs were ordered in 1981 from the Soviet Union and delivered in 1981 (the vehicles were previously in Soviet service). 30 BTR-60s in service in 2001. Currently 30 BTR-60s are in service. Bulgaria - 900 BTR-60Ps and BTR-60PAUs were ordered in 1962 from the Soviet Union and delivered between 1964 and 1972 (some of the delivered vehicles were most probably BTR-60PB). Currently 781 BTR-60s are in service including 150 BTR-60PBs modernized to the BTR-60PB-MD1 standard. Cambodia - 40 BTR-60PBs were ordered in 1989 from the Soviet Union and delivered in 1990 (the vehicles were probably previously in Soviet service). At peak there were 210 BTR-60s. Currently 160 BTR-60s are in service. People's Republic of China – Captured 4 BTR-60PBs from the Soviet Union during the Sino-Soviet border conflict in March 1969. Produced and operated a small number of copies designed through reverse engineering. Democratic Republic of the Congo – 30 BTR-60PBs were ordered in 2000 from Ukraine and delivered in 2000 (the vehicles were previously in Soviet and later Ukrainian service). 6 more BTR-60s were bought from Ukraine on the same year. Congo - 28 BTR-60PBs were ordered in 1984 from the Soviet Union and delivered in 1984 (the vehicles were probably previously in Soviet service). Currently 30 BTR-60s are in service. Croatia – 16 TAB-71s captured from JNA and later scrapped. In 1998 there were 17 MT-LBs, BOVs and LOV variants in service with the Croatian army and BTR-60s in service with the police. Cuba - 150 BTR-60Ps were ordered in 1961 from the Soviet Union and delivered between 1962 and 1964. Cuba also bought a number of BTR-60PBs. 10 BTR-60PU-12s were ordered along with 40 9K31 SAM systems in 1984 from the Soviet Union and delivered between 1985 and 1986. Currently 400 BTR-60s are in service. Djibouti - 12 BTR-60PBs ordered in 1979 from Iraq and received as aid in 1980 (the vehicles were previously in Iraqi service). 1 was later fitted with a turret from the French AML-90 light armoured car. (See Djibouti section for details). Egypt – A few hundred BTR-60s and BTR-152s acquired before June 1967. 650 BTR-60PBs were ordered in 1969 from the Soviet Union and delivered between 1970 and 1973. Currently 200 BTR-60PBs are in service. Eritrea – Currently 65 are in service. Ethiopia - 100 BTR-60PBs were ordered in 1977 from the Soviet Union and delivered between 1977 and 1978 (the vehicles were probably previously in Soviet service). 200 BTR-60PBs were ordered in 1980 from the Soviet Union and delivered between 1980 and 1981 (the vehicles were probably previously in Soviet service). 250 BTR-60PBs were ordered in 1984 from the Soviet Union and delivered between 1985 and 1986 (the vehicles were previously in Soviet service). Currently 80 BTR-60PBs are in service. Ghana – Currently 6 are in service. Georgia – 3 BTR-60s and BTR-70s used in War in Abkhazia (1992–1993). 1 BTR-60 in service in 2005 and 2008. Grenada – 6 BTR-60PBs were ordered in 1981 from the Soviet Union and delivered in 1982 (the vehicles were probably previously in Soviet service). Currently 2 are in service. Guinea - 8 BTR-60PBs were ordered in 1983 from the Soviet Union and delivered in 1983 (the vehicles were second hand). Currently 20 are in service. Guinea-Bissau - 15 BTR-60PBs were ordered in 1979 from the Soviet Union and delivered in 1979 (the vehicles were probably second hand). Currently 35 are in service. Hungary – 150 BTR-60Ps were ordered in 1961 from the Soviet Union and delivered in 1963. 7 BTR-60PU-12s were ordered along with 7 9K35 SAM batteries in 1979 from the Soviet Union and delivered between 1979 and 1983. India - 56 BTR-60PBs were ordered in 1976 from the Soviet Union and delivered in 1977. 50 BTR-60PU-12s were ordered along with 200 9K31 SAM systems in 1979 from the Soviet Union and delivered between 1979 and 1984. At peak there were 817 BTR-60s in service. 50 BTR-60PBs were in service in 1990, none in service in 1995. BTR-60PU-12s are probably still in service. Iran - 300 BTR-60Ps were ordered in 1966 from the Soviet Union along with 270 BTR-50s as a $110 deal and delivered between 1967 and 1968. 200 BTR-60PBs were ordered in 1986 from the Soviet Union and delivered between 1986 and 1987 (the vehicles were probably previously in Soviet service). Currently 150 are in service. Israel – Captured a number from Egypt or Syria. Some of them have been converted into mortar carriers (See Israel section for details). Kazakhstan – There were 300 BTR-60s and BTR-50s in service in 2000, 2002 and 2005. Kenya – Currently 24 are in service. North Korea - 100 BTR-60PBs were ordered in 1973 from the Soviet Union and delivered between 1974 and 1975. There were 1,010 Korshuns, VTT-323s, Type 63s (YW-531), BTR-40s, BTR-50s, BTR-60s and BTR-152s in service in 1985, 2,200 VTT-323s, Type 63s (YW-531), BTR-40s, BTR-50s, BTR-60s and BTR-152s in service in 1990 and 1995 and 2,500 VTT-323s, Type 63s (YW-531), BTR-40s, BTR-50s, BTR-60s and BTR-152s in service in 2000, 2002 and 2005. Currently 1,000 BTR-60s are in service. Kyrgyzstan – There were 96 in service in 1995 and 53 in 2000 and 2005. Laos - 35 BTR-60Ps were ordered in 1980 from the Soviet Union and delivered between 1981 and 1982 (the vehicles were probably previously in Soviet service). Currently 70 are in service. Liberia – 8 TAB-71s ordered in 1986 from Romania and delivered in 1987 (the vehicles were previously in Romanian service, part of a deal worth $4 million). Libya - 100 BTR-60PBs were ordered in 1974 from the Soviet Union and delivered in 1975. 60 BTR-60PBs were ordered in 1976 from the Soviet Union and delivered in 1976. At peak there were 750 BTR-60s in service. 700 BTR-50s and BTR-60s were in service in 1986. Currently 540 BTR-50s and BTR-60s are in service. BTR-60PB in Lithuanian army service. Lithuania - 15 BTR-60PBs (in some sources – BTR-60PA) were ordered in 1992 from Russia and delivered in 1992 (the vehicles were previously in Soviet and later Russian service, some lacked their armament). 14 BTR-60PBs were bought in 1995 from Russia. There were 27 BTR-60PBs in service in 2006 and 2007. Currently 20 BTR-60s are in service. Macedonia – Currently 35 are in service. Mali - 10 BTR-60PBs were ordered in 1982 from the Soviet Union and delivered in 1982 (the vehicles were probably second hand). Mexico - Bought 30 BTR-60-based firefighting variants from Irtish company and converted them into APC-70s. All in service with the marine units. Republic of Moldova – 27 BTR-60PBs inherited from the Soviet Union in 1991. 161 TAB-71Ms ordered in 1992 from Romania and delivered between 1992 and 1995 (the vehicles were previously in Romanian service). Currently 12 BTR-60PBs and 121 TAB-71Ms are in service. Mongolia - 50 BTR-60PBs were ordered in 1975 from the Soviet Union and delivered between 1975 and 1976. Currently 300 BTR-60s are in service. Morocco - Currently more than 45 are in service. Mozambique - 30 BTR-60PBs were ordered in 1977 from the Soviet Union and delivered in 1977 (the vehicles were probably previously in Soviet service). 60 BTR-60PBs were ordered in 1979 from the Soviet Union and delivered between 1981 and 1986 (the vehicles were previously in Soviet service). More than 150 BTR-60s in service in 2001. Currently 150 BTR-60s are in service. Namibia – 10 BTR-60s in service in 2001. Nicaragua - 84 BTR-60PBs were ordered in 1981 from the Soviet Union and delivered between 1981 and 1988 (the vehicles were probably previously in Soviet service). Currently 64 BTR-60PBs are in service. Nigeria – Currently 6 are in service. Peru – Currently 12 are in service. Poland - Milicja Obywatelska used several BTR-60PAs. They were used by ZOMO riot control units. Polish Army received a dozen BTR-60PU-12s along with the Soviet supplied 9K33 Osa SAM regiment delivered between 1980 and 1985. Polish Ministry of Internal Affairs received 25 BTR-60PBs from the Soviet Union as aid in the early 1980s. They were used by ZOMO. They were also used later by the Polish Police. A few Police BTR-60PBs are kept in storage for anti-riot duty as barricade breakers. Romania – Produced 1,872 TAB-71s, TAB-71Ms, TERA-71s, TERA-71Ls, TAB-71A R-1450s, TAB-71A R-1451s, TAB-71A R-1452s and 491 TAB-71ARs between 1970 and 1990 for the Romanian army. More were produced for export. Currently 965 TAB-71s, TERA-71s, TERA-71Ls, TAB-71A R-1450s, TAB-71A R-1451s, TAB-71A R-1452s and 491 TAB-71ARs are in service. Russia – There were 4,900 BTR-60s, BTR-70s and BTR-80s in service in 2002 and 2003 including 750 in service with the Naval infantry and 280 in service the coastal defense forces. 6,000 BTR-50s, BTR-60s, BTR-70s, BTR-80s and BTR-152s in service in 2000, 2005 and 2008. Currently 17 are in active service and some are kept in storage. Somalia - 10 BTR-60PBs were ordered in 1976 from the Soviet Union and delivered in 1976. 5 are currently in service. Syria - 150 BTR-60PBs were ordered in 1970 from the Soviet Union and delivered between 1970 and 1971. 500 BTR-60PBs were ordered in 1973 from the Soviet Union and delivered between 1973 and 1975. Around 1,500 BTR-40s, BTR-50s, BTR-60PBs, BTR-152s and OT-64s in service in 1990, 1995 and 2000 and around 1,600 in 2001, 2003 and 2005. 600 BTR-60PBs are currently in service. Tajikistan – 7 were inherited from Soviet Union. 1 in service in 2000 and 2005. Turkey - 300 SPW-60PBs were ordered in 1990 from Germany with 195 being delivered between 1990 and 1991 and 105 being delivered in 1992 (the vehicles were previously in East German service, part of the CFE Cascade programme). 23 BTR-60PBs were ordered in 1993 from Russia and delivered in 1993 (the vehicles were previously in Soviet and later Russian service, part of a $75M deal, used by the police). Turkmenistan – There were 543 BTR-60s, BTR-70s and BTR-80s in service in 1995 and 829 in 2000 and 2005. Uganda – 20 BTR-60s in service in 1999. Ukraine – 500 were inherited from the Soviet Union. 220 in service in 1995, 202 in 2000 and 176 in 2005. Uzbekistan – There were 24 in service in 2000 and 2005. Currently 24 are in service. Vietnam - 500 BTR-60PBs were ordered in 1978 from the Soviet Union and delivered between 1978 and 1980 (the vehicles were probably previously in Soviet service). Currently 400 BTR-60s are in service. Yemen - Currently 500 are in service. Zambia - 13 BTR-60PBs were ordered in 1979 from the Soviet Union and delivered in 1980 (the vehicles were probably previously in Soviet service, part of the deal worth between $72 million and $100 million). Currently 13 are in service. Czechoslovakia - 28 BTR-60PU-12s were ordered along with 28 9K31 SAM batteries in 1979 from the Soviet Union and delivered between 1980 and 1989. 5 BTR-60PU-12s were ordered in 1982 from the Soviet Union and delivered between 1982 and 1984 (used in 5 9K33M Osa-M SAM batteries). 25 BTR-60PU-12s were ordered in 1984 from the Soviet Union and delivered between 1984 and 1990 (used in 25 9K35 Strela-10 SAM batteries). East Germany - 1,500 SPW-60Ps, SPW-60PAs and SPW-60PBs were ordered in 1963 from the Soviet Union and delivered between 1965 and 1970. 24 BTR-60PU-12s were ordered along with 24 9K31 SAM batteries in 1978 from the Soviet Union and delivered between 1979 and 1984. 260 SPW-60PAs and 2,000 SPW-60PBs (including variants) were passed on to the unified German state. Finland - 120 BTR-60PBs were ordered in 1975 from the Soviet Union and delivered in 1976. Being withdrawn from service as of 2006. Germany – 260 SPW-60PA and 2,000 SPW-60PB (including variants), taken from GDR's army; all scrapped or sold to other countries. Iraq – 250 BTR-60PBs were ordered in 1970 from the Soviet Union and delivered between 1971 and 1975. At peak there were 500 BTR-60s in service. There were 3,500 BTR-50s, BTR-60s, BTR-152s, EE-11 Urutus, Panhard M3s, M113A1s, M113A2s, OT-62 TOPASess, OT-64 SKOTs and Walids in service in 1990, around 2,000 BTR-50s, BTR-60s, BTR-152s, EE-11 Urutus, Panhard M3s, MT-LBs, OT-62 TOPASes, OT-64 SKOTs, Walids and YW-701s in 1995, around 2,400 BTR-50s, BTR-60s, BTR-152s, EE-11 Urutus, Panhard M3s, MT-LBs, OT-62 TOPASes, OT-64 SKOTs, Walids and YW-701s in 2000 and around 2,400 BTR-50s, BTR-60s, BTR-152s, EE-11 Urutus, Panhard M3s, MT-LBs, M113A1s, M113A2s, OT-62 TOPASes, OT-64 SKOTs, Walids and YW-701s in 2002. Lebanon – 18 BTR-60PBs delivered by Iraq to the Lebanese Forces in 1988. Unknown number of vehicles delivered by Syria to the Druze Progressive Socialist Party militia in 1983. Soviet Union – Produced around 25,000 BTR-60s. 35,500 BTR-50s, BTR-60s, BTR-70s, BTR-80s and BTR-152s in service in 1985. 4,191 BTR-60s in service with units station in the European part of Soviet Union in 1990. Passed on to successor states. North Yemen – 150 BTR-60PBs were ordered in 1979 from the Soviet Union and delivered in 1980 (the vehicles were probably previously in Soviet service). South Yemen – 100 BTR-60PBs were ordered in 1981 from the Soviet Union and delivered between 1981 and 1982 (the vehicles were probably previously in Soviet service). 40 BTR-60PBs were ordered in 1986 from the Soviet Union and delivered in 1986 (the vehicles were probably previously in Soviet service). Yugoslavia – 80 BTR-60Ps were ordered in 1965 from the Soviet Union and delivered in 1966. 40 TAB-71s were ordered in 1978 from Romania and delivered between 1980 and 1981 (used by the police). Zaire – 10 BTR-60PBs were ordered in 1980 from an unknown supplier and delivered in 1980 (the vehicles were probably second-hand). Passed on to the successor state. ↑ 2.00 2.01 2.02 2.03 2.04 2.05 2.06 2.07 2.08 2.09 2.10 2.11 2.12 2.13 2.14 2.15 2.16 2.17 2.18 2.19 2.20 2.21 2.22 2.23 Pancerni 1. Pancerni.abajt.pl. Retrieved on 21 September 2011. ↑ 4.00 4.01 4.02 4.03 4.04 4.05 4.06 4.07 4.08 4.09 4.10 4.11 4.12 4.13 4.14 4.15 4.16 4.17 4.18 4.19 4.20 4.21 4.22 4.23 4.24 4.25 4.26 4.27 4.28 4.29 4.30 4.31 4.32 4.33 4.34 4.35 4.36 4.37 4.38 4.39 4.40 4.41 4.42 4.43 4.44 4.45 4.46 4.47 4.48 4.49 4.50 4.51 4.52 SIPRI Arms Transfers Database. Armstrade.sipri.org. Retrieved on 21 September 2011. ↑ 6.00 6.01 6.02 6.03 6.04 6.05 6.06 6.07 6.08 6.09 6.10 6.11 6.12 6.13 6.14 6.15 6.16 6.17 6.18 6.19 6.20 6.21 6.22 6.23 6.24 6.25 6.26 6.27 6.28 6.29 6.30 6.31 6.32 6.33 6.34 6.35 6.36 6.37 6.38 6.39 6.40 6.41 6.42 6.43 Gary's Combat Vehicle Reference Guide. Inetres.com (1 November 2007). Retrieved on 21 September 2011. ↑ IN0534 Edition D Lesson 2 Threat Light Armored Vehicles Identification and Capabilities. Globalsecurity.org (27 April 2005). Retrieved on 21 September 2011. ↑ 9.0 9.1 FAS BRDM-2. Fas.org. Retrieved on 21 September 2011. ↑ 10.0 10.1 10.2 10.3 10.4 10.5 10.6 Pancerni 2. Pancerni.abajt.pl. Retrieved on 21 September 2011. ↑ 11.0 11.1 11.2 11.3 11.4 11.5 11.6 11.7 11.8 OPFOR Worldwide Equipment Guide, TRADOC DCSINT Threat Support Directorate, January 1999. ↑ KAT-orygie-0/24-49-soderzanie. Web.archive.org (3 November 2006). Retrieved on 21 September 2011. ↑ 14.0 14.1 14.2 14.3 14.4 JED Ob'yekt. Jedsite.info. Retrieved on 21 September 2011. ↑ 26.0 26.1 26.2 26.3 ZOMO Equipment. Zomoza.kgb.pl. Retrieved on 21 September 2011. ↑ People's Liberation Army. Globalsecurity.org. Retrieved on 21 September 2011. ↑ BTR-60PBM. None. Retrieved on 21 September 2011. ↑ Нижегородская деловая энциклопедия 2008. Innov.ru. Retrieved on 21 September 2011. ↑ Air Power Australia 9K35. Ausairpower.net (30 May 2011). Retrieved on 21 September 2011. ↑ IDELF 2006 defence exhibition. Worldwide-defence.blogspot.com (23 April 2011). Retrieved on 21 September 2011. ↑ Video showing modernized BTR-60 and BRDM-2. Youtube.com (21 January 2008). Retrieved on 21 September 2011. ↑ strangernn: Интересный концепт модернизации БТРов от "Муромтепловоза"!. Strangernn.livejournal.com. Retrieved on 21 September 2011. ↑ Наши координаты. Muromteplovoz.ru. Retrieved on 21 September 2011. ↑ Saymar''s'' BTR-60 and BTR-70 modernization program promotional video. Youtube.com (31 August 2009). Retrieved on 21 September 2011. ↑ Angola – Security Information. Iss.co.za. Retrieved on 21 September 2011. ↑ 50.0 50.1 Международный Контроль Над Обычными Вооружениями И Неконтролируемое Оружие. (PDF) . Retrieved on 21 September 2011. ↑ Belarus Army Equipment. Globalsecurity.org. Retrieved on 21 September 2011. ↑ Botswana – Security Information. Iss.co.za. Retrieved on 21 September 2011. ↑ 55.0 55.1 55.2 Deagel BTR-60. Deagel.com (10 March 2011). Retrieved on 21 September 2011. ↑ Croatian Armor. Vojska.net. Retrieved on 21 September 2011. ↑ Georgia Army. Globalsecurity.org. Retrieved on 21 September 2011. ↑ Indian Army Equipment. Globalsecurity.org. Retrieved on 21 September 2011. ↑ Kazak Ground Forces Equipment. Globalsecurity.org. Retrieved on 21 September 2011. ↑ Kyrgyz-Army Equipment. Globalsecurity.org. Retrieved on 21 September 2011. ↑ Army Equipment. Globalsecurity.org. Retrieved on 21 September 2011. ↑ UN Register of Conventional Arms. Disarmament.un.org. Retrieved on 21 September 2011. ↑ Mozambique – Security Information. Iss.co.za. Retrieved on 21 September 2011. ↑ Namibia – Security Information. Iss.co.za. Retrieved on 21 September 2011. ↑ Russian Armed Forces: 1999 -2003. 2008. Warfare.ru. Retrieved on 21 September 2011. ↑ 73.0 73.1 Soviet/Russian Army equipment. Globalsecurity.org. Retrieved on 21 September 2011. ↑ BTR-60. Warfare.ru. Retrieved on 21 September 2011. ↑ Syria – Army Equipment. Globalsecurity.org. Retrieved on 21 September 2011. ↑ Tajik-Army Equipment. Globalsecurity.org. Retrieved on 21 September 2011. ↑ Uganda – Security Information. Iss.co.za. Retrieved on 21 September 2011. ↑ Ground Forces Equipment – Ukraine. Globalsecurity.org. Retrieved on 21 September 2011. ↑ Uzbek-Army Equipment. Globalsecurity.org. Retrieved on 21 September 2011. Wikimedia Commons has media related to BTR-60. This page was last modified on 10 January 2016, at 04:45.